I bought a new Christmas kitchen towel at World market a couple of weeks ago, solely because it was cookie inspiration the minute I saw it! The towel's graphics feature kids' letters to Santa with iconic Christmas decorations, such as candy canes, colored lights, and Christmas trees. I knew right away it would translate into an easy and adorable cookie! All it took was rectangular cookies, white royal icing and food markers. It would definitely be a fun cookie craft for kids. They'd be able to write their wish list on the cookie and leave it for Santa, along with a glass of milk, on Christmas eve. 1. Roll out sugar cookie dough about 3/8-inch thick. 2. Use spatula to transfer to a baking sheet. 3. Place baking sheets in freezer for about 10 minutes to help cookies hold their shape. 4. Using a decorating bag fitted with a #3 tip, outline and fill in the cookie with the untinted royal icing. 5. Let royal icing dry overnight. 6. 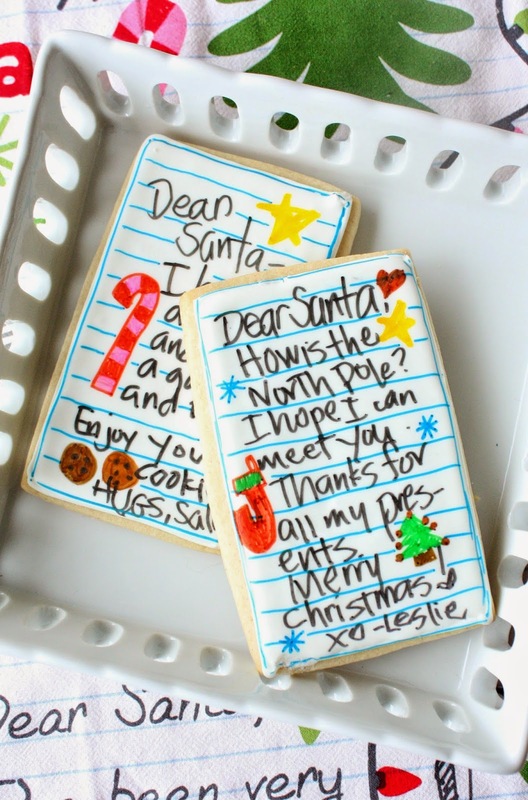 Using the food safe markers, compose letters to Santa, adding small decorations too. 7. Add lines to the letter if you'd like. (I added the lines (freehand) after I wrote the letter, but of course you can add the lines first if you'd like, or leave the them off altogether. I want those! I may have to squeeze in some time for cookies! I bought adorable cutters at Cookie Con, but have been too crazy to do anything. I adore these. Wouldn't these be fun to leave out on Christmas Eve! You are the best!! Thanks for your comment, Jackie! Merry Christmas! i have been a good girl. (kinda) please bring me incredible cookie skills like Sue and i promise i'll leave you some extra large cookies by the fireplace. ...by your cute, marshmallow treat fireplace, right? :) Thanks for your comment, Lisa! These are so impressive, Sue. Where did you get the food safe markers? Amazon? Wonderful idea Sue, this is so incredible! Absolutely must put these on my baking list for next Christmas! I can't believe I missed these last Christmas! MM is my first site to visit after seeing Lisa's awesome cookie collages. 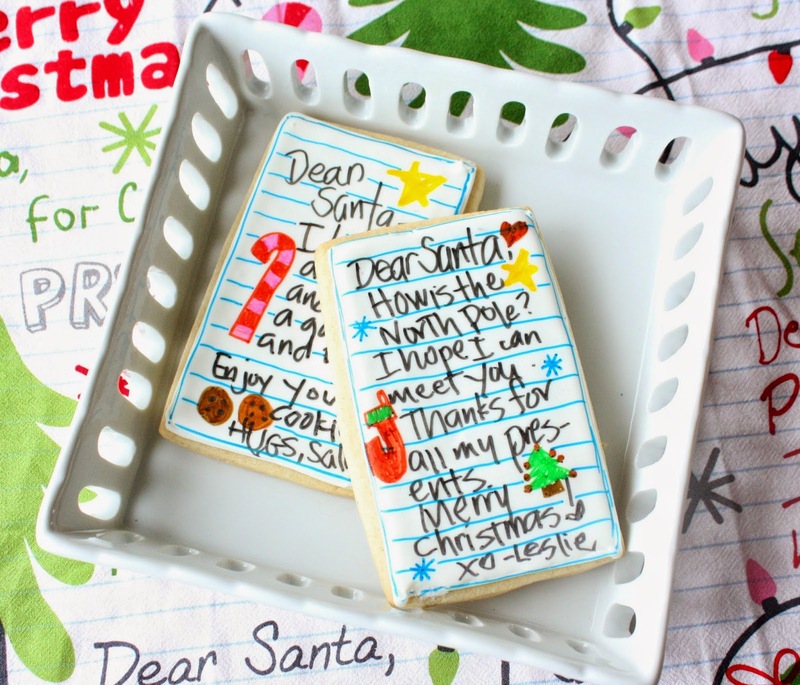 Your letters to santa cookies are utterly adorable! My grandbabies love making sugar crafts @ Grandma's house, and I know they're going to love these! Such a cute idea! Thanks for sharing your cookies with The Bearfoot Baker!